I’ll admit it. I’m not ashamed. I’m a big baby and I’ve been chickening out from reading The Twelve by Justin Cronin for months. I ran out and got it the day it came out. I in fact have two copies of it, one signed and one that I was gonna read and mark up. It was one of the few books that made it into the suitcase for the move to the east coast cuz I was gonna read it right away. Cut to almost a year and half later and I finally put on my big girl pants and read it. For better or worse, The Twelve isn’t as scary as The Passage. It’s still a rollercoaster where it makes you happy and sad. Cronin continues to gives us puzzle pieces of what came before and after the vampire apocalypse. But best of all I never had a clue as to where Cronin was taking this story. 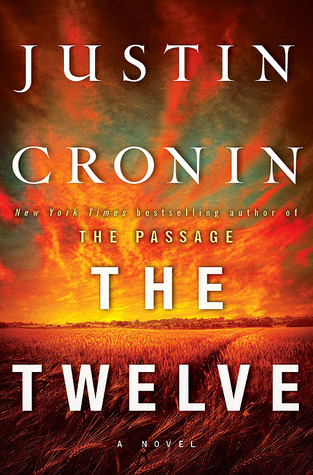 Once again, Cronin presents things out of chronological order but it didn’t discombobulate me as much as it did in The Passage. I think that is because I had 100% faith in Cronin this time around and knew that these seemingly ‘random’ characters and puzzle pieces were connected and that it would all come together in the end. Once again, I don’t want to say too much because I don’t want to spoil the wild ride. After reading this all I can say is WOW. H.E.A.D. E.X.P.L.O.S.I.O.N. I have no clue what the final book will be like but I know that it won’t take me over a year to get to it. This entry was posted in Adult Fiction, Vampires and tagged Adult Fiction, Justin Cronin, scary, The Passage Book 2, The Twelve, Vampires. Bookmark the permalink.